Mumbai, 27th February 2017: Kokuyo Camlin Ltd (formerly known as Camlin Ltd) premier and pioneer stationery and art marketer has recently launched some really funky and innovative products for school children. 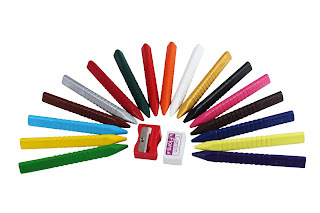 From the unique triangular plastic crayons to some other cool stationery products. Triangular Crayons!! What will they think of next? The Camel Triangular Plastic Crayons are distinct with the triangular design shape– specially designed for kids to get a better grip. They come in attractive colors and are non-smudging – so kids do not get their hands all dirty. These crayons can be sharpened. Also they are easily washable – a huge relief for mothers with kids that scribble on any surface. Since these crayons are specially designed keeping kids in mind they are non-toxic and extremely safe for children to use.Priced at Rs.100, the Camel Triangular Plastic Crayons also has a free sharpener and an eraser. So what are you waiting for? Get your kids to experience these funky products. Kokuyo Camlin Limited www.kokuyo.co.in (formerly known as Camlin Limited) www.kokuyo.co.in is in the business of marketing and selling of art materials and stationery products under flagship brands ‘Camel’ and ‘Camlin’ which have been in existence. for more than 80 years . The company offers a wide range of products such as Fine Art materials, scholastic colours and stationery, hobby products, office products, writing and drawing instruments, adhesives and notebooks. In the year 2011, Kokuyo S&T ltd, a Japanese corporation engaged in the business of stationery, notebooks and school furniture acquired majority stake in the Company. Kokuyo S&T ltd is a 100% subsidiary of Kokuyo Co. Ltd., Japan. Kokuyo S&T’s product line includes office stationery, notebooks and office supplies.